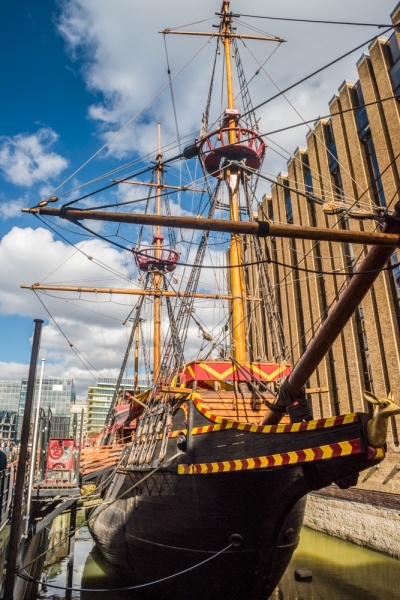 The Golden Hinde is a life-sized replica of Sir Francis Drake's flagship, the Golden Hinde, on which Drake circumnavigated the globe in a voyage beginning in 1577. 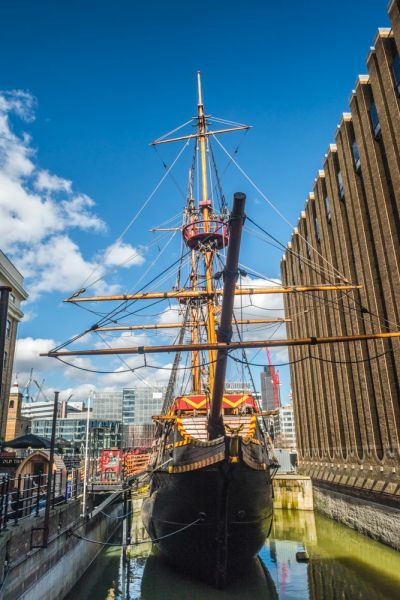 The ship is docked at St Mary Overie Dock, Bankside, a short walk from both Southwark Cathedral and the reconstruction of Shakespeare's Globe Theatre. This is not just a museum, but an actual working ship. It was built in 1973 in Devon, and since that date has sailed over 100,000 miles, including a recreation of Drake's global circumnavigation voyage. 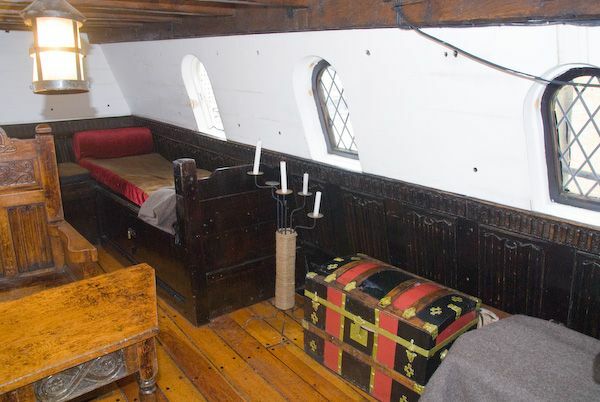 It is full of replica period furniture, weapons, and nautical gear, giving a vivid picture of what it would have been like aboard ship on the Hinde's famous voyage. Visitors can explore the entire ship, from Drake's cabin to the hold, where barrels of provisions were stored. 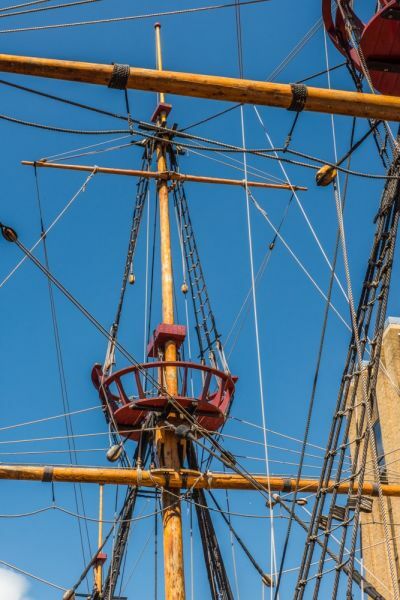 A certain amount of agility may be called for if you visit the gun deck, which is sandwiched between the hold and the main deck. The ceiling on the gun deck is about half-height, barely high enough for a small child to stand erect. 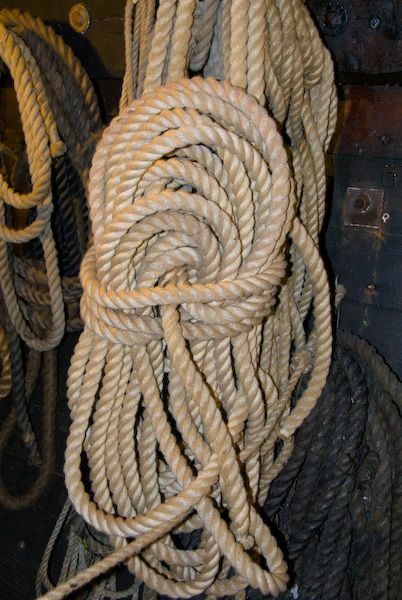 It was made this way in order to better distribute the weight of the ship. 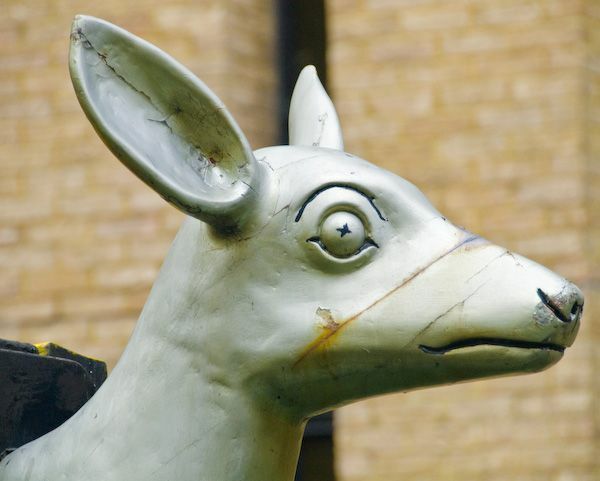 The Golden Hinde offers a range of living history education programmes, especially suitable to help children gain an understanding of the Elizabethan period and the life of Drake and his contemporaries. In addition to normal, self-guided admission, the Golden Hinde can be visited with a special guided tour, led by guides in pirate costume. 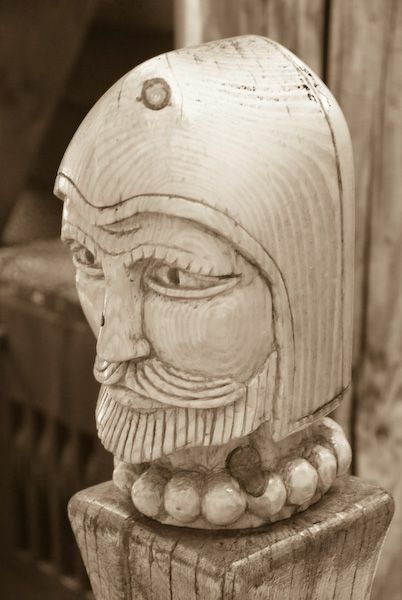 There are also pirate fun days, and family sleepovers, and Tudor family day options. 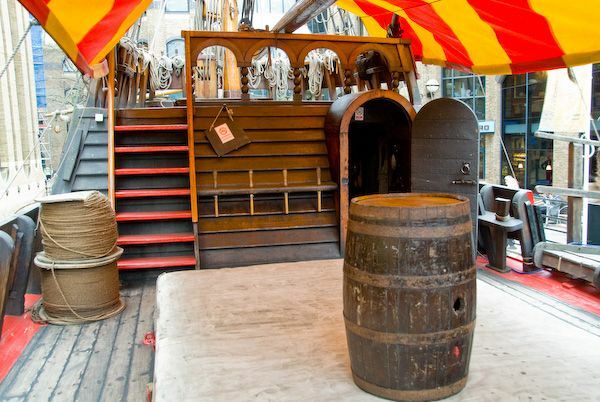 The Golden Hinde is also available for filming, corporate events, and weddings. 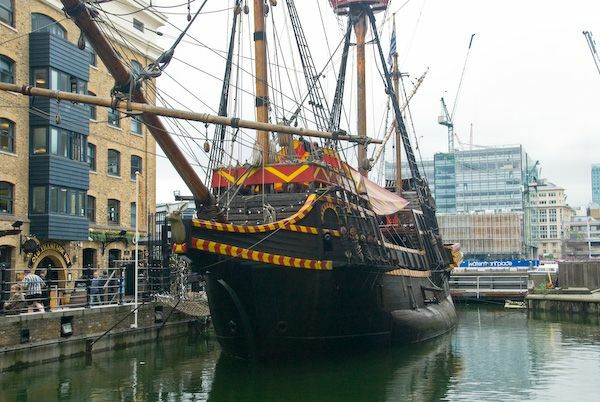 Families will enjoy the Golden Hinde. We visited with our two children, aged 14 and 8, and they loved it! The youngest loved the chance to climb the ladders and explore all the corners of the ship - but don't worry, there's no place they will get lost! A very enjoyable time, and reasonably priced tickets (prices, of course, are subject to change. 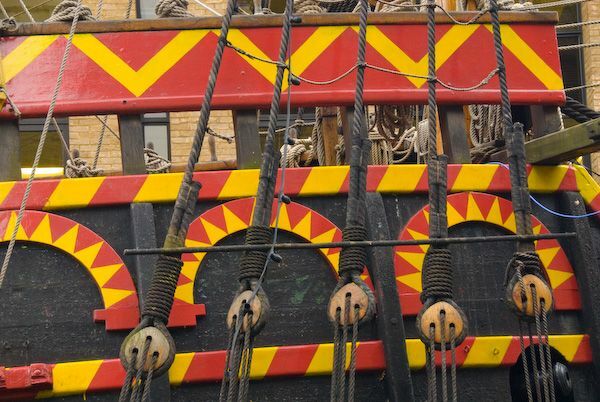 Check the Golden Hinde website for current prices). 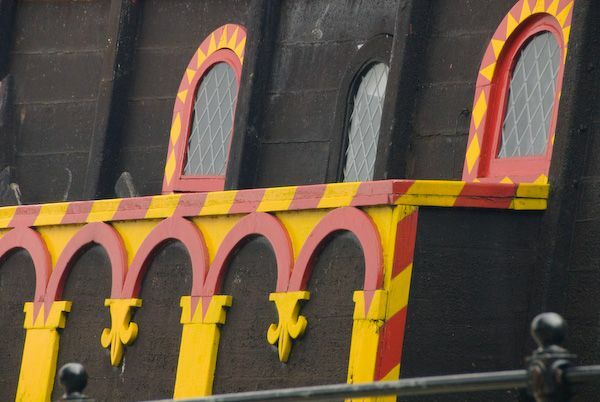 At the time of this writing, the Golden Hinde is open 7 days a week, excepting Christmas and New Years. 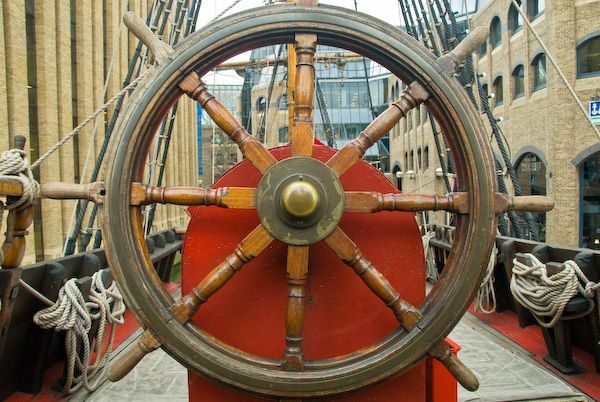 Access is very easy; the ship is located 3 blocks west of London Bridge tube and rail station, just past Southwark Cathedral.